Trained Jewelry Experts, Right Here in Hickory! Terry and Teresa, founders of The Jewelry Exchange, currently manage both locations. They have been married since 1980 and have two beautiful girls, Kristen and Kelly and recently added a new son-in-law, Deaton. 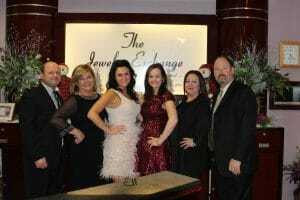 At age twenty one, Terry founded The Jewelry Exchange as small town local jewelry shop for the local community. 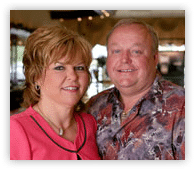 Terry and Teresa believe their success in the Jewelry Industry for over thirty years is attributed to providing first-class customer service. Terry and Teresa enjoy traveling around the world, tailgating at Clemson football games, and having BBQ's. Terry is certified by The Gemological Institute of America (GIA) as a Graduate Gemologist. Teresa is certified by GIA as an advanced diamond grader, pearl grader, colored stone grader, and a gemological identification specialist. After graduating from Clemson University with a Finance Degree, Kelly spent seven years working in the banking industry before returning to Hickory to join the family business. Kelly is a GIA Graduate Gemologist. Kelly and her husband Deaton recently welcomed their first child, Kennedy Nichole - and the first grandchild for Terry and Teresa. Kelly enjoys being back in Hickory and working closely with her parents to learn the jewelry business. She spends her time away from the store chasing her baby girl around the house! Kelly's favorite part of the job is helping clients create those custom special pieces of jewelry that will last for generations. Kristie is the General Manager for both locations, but is located full time at our Viewmont location. She is a married mother to four boys; Konner, Kollin, Karsten, and Karter . She has worked at The Jewelry Exchange for since 1982. Her hobbies include baseball, basketball, and football (or any sports with her kids). Kristie is certified by GIA as a diamond grader, colored stone grader, and a gemological identification specialist and is currently completing The Graduate Gemologist program at GIA. Gloria is a married mother of three and a grandmother of three. Gloria has been in the retail business since 1986 -- and with The Jewelry Exchange since 2003. Her hobbies include golf and spending time with her family. Gloria is certified by GIA as a diamond grader. Donna is married and has been with The Jewelry Exchange since 1982. Her hobbies include traveling, scrapbooking, cross-stitching, and watching Nascar. Tony is the newest member to The Jewelry Exchange family, he brings with him a wealth of retail experice - since 1991. Tony and his wife, Jenene have one daughter Madigan. Tony enjoys spending time with his family and friends and loves sports of all kinds especially golf. Tony, like several members of The Jewelry Exchange Family, is a big Tarheel Fan. Dot is a married with two children and grandchildren. Dot has been with The Jewelry Exchange since 1982. Her hobbies include bridge, tennis, and cooking. Dot is considered the "grandmother" of our staff being the oldest member and is responsible for most of our decorating. Gale is married with five children, a grandmother of seven, and a great grandmother of five. She has been with The Jewelry Exchange since 1987. Her hobbies include cooking and spending time with her family. Carol is a married mother of one with twenty-one years of retail experience -- sixteen of those with The Jewelry Exchange. Her hobbies include hiking, walking, and riding ATV's.